Wow, what a day. They say it isn’t possible. We have spinnaker that points! But I need to back up a bit. I visited Yager Sails last winter to order some new sails for our adventure on our 1980 Tartan 37c. When I walked through the door I wanted a new genoa and an asymmetrical cruising spinnaker. What every good cruiser needs in their sail quiver. After a few very informative visits with Don Yager, he told me he had developed a large light wind cruising sail that would do everything I wanted my asymmetrical or drifter to do but I could also point (go upwind) with this sail. I was skeptical and my wife was even more so. I thought that if it even had the reaching and downwind performance that I was after then I would be content. So after a few days of contemplation, I ordered a genoa and what Don called the G-Spinn . Fast forward three months and we have a new genoa and G-Spinn on our boat. We have been very impressed with the new genoa. It’s a huge upgrade from what came with our boat. We no longer feel the need to fire up the engine when the wind isn’t in our favor. 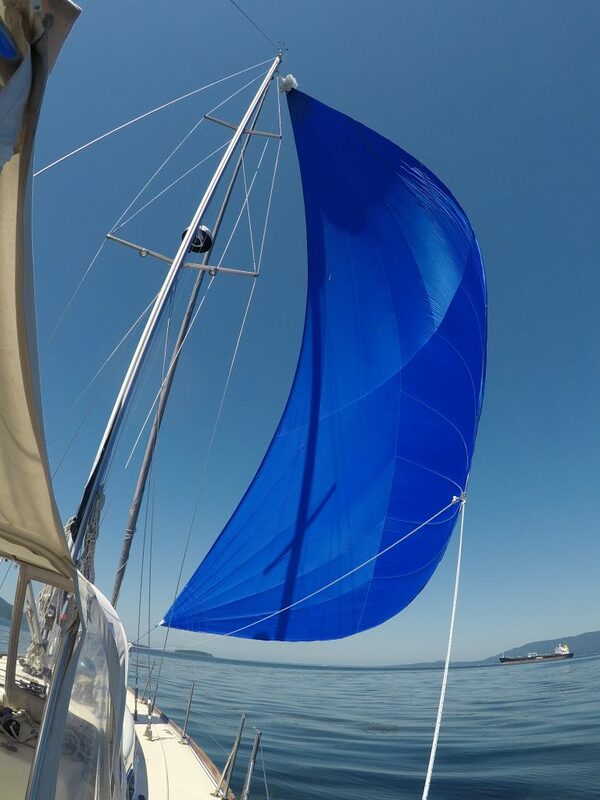 On what we deemed as a very low risk day to try the new G-Spinn, we rigged it up and launched it and had a 3 hour downwind sail without touching a thing on the first try. We were sailing at 6 knots in 8 knots of wind and (at least in my mind) blowing by the other sailboats in the channel. Two months later, Don and Mary Yager of Yager sails were in town to do some work and offered to come aboard and give us some tips on using the new G-Spinn. Who gets a chance to have their sailmaker aboard? Nobody. Except us! We couldn’t have asked for better weather or better company. The wind was out of the northeast and Don said lets launch it. We were sailing 30 degrees off the wind with a big cruising sail. Closer to the wind than I had ever sailed with my old genoa and what according to most people can’t be done. I showed my disbelief. Don confidently said… “and they said it couldn’t be done”. We soon found out how much this sail has to offer. Don said he developed the sail out of frustration that all the sails available that fit into the “categories” of sails didn’t perform the way he thought a sail could. From this he developed the G-Spinn. It rides very happily and comfortably away from the boat and need very little tending once it finds its “happy place”. We learned how to gybe the sail, douse it in some heavier for us (12 knot) winds and tune the sail on all points. At the end of the day we felt confident that this will now be our “go to” sail in winds under 12 knots. We finished the day with dinner at a local pub with Don and Mary. Our day couldn’t have been more complete. A day of instruction with the maker of our new cruising sails, laid back conversation and a meal at the local pub. Not sure how life can get much better but I have a feeling we are just scratching the surface.